This page will offer some spring cleaning tips for helping your home to sparkle and your body to radiate health. Spring is the perfect time to do some deep cleaning, both in your home and inside your body. Spring denotes the changing of the seasons. If you live in an area on the planet where spring isn't a distinct season (like the tropics) then you can relate this information to when seasons in your area do change, for example when it changes from rainy season to dry season and vice versa. In Nature, spring is usually when rainfall is abundant, cleansing and refreshing the environment. Keeping in tune with Nature's rhythms, this is a perfect time to do some cleansing of your own. The changing of the seasons is a natural time of cleansing and by taking advantage of this time, your own cleansing efforts will be rewarded with more effective results. The biggest of all spring cleaning tips that I can offer is to encourage you to pay attention to cleaning your home AND your body. One is a reflection of the other and your overall holistic health will be enriched by cleansing both. 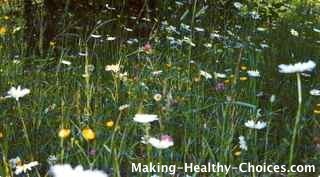 Have you ever noticed that when the seasons change many people get stuffy heads and runny noses? This is your body's natural attempt to cleanse itself of impurities. You can assist this natural process by eating a very clean diet of fruits and vegetables or by doing a detox cleanse. I have written a very detailed page on why to detox and another page with details on doing a detox cleanse. Read both of these pages to learn more about how to detox, or how to do a cleansing fast or a cleansing diet. Read here for all the juicy details on how to do a 10 day juice fast. A page on spring cleaning tips wouldn't be complete without a reminder that spring cleaning is about removing clutter. In our homes this is easy to understand, in our bodies maybe not so easy. Each spring we clear our home of clutter and give everything a good cleaning. In our bodies we need to do the same. Meal after meal of eating hard to digest foods, along with the absorption of chemicals from the environment, beauty products, medicines or drugs etc. leaves our bodies with a lot of clutter. On a daily basis most of us are ingesting more toxins than our systems can handle. What happens then is that our bodies store these toxins, or unwanted clutter, away hoping to have a chance to clear them out later. A spring detox cleanse is a perfect chance to allow your body to do this! Use this opportunity to follow a cleansing diet or to do a detox cleanse and your overall health will improve in more ways than you can imagine. Just as toxins build up in your body, so does filth and clutter build up in your home. Daily cleaning is important and spring is a perfect time to do some of that deeper cleaning. Do one room at a time, play music, sing and enjoy yourself while you clean. Remove clutter in your home by donating or recycling things that you no longer use... or that you have never used. There is someone out there that could make good use of these things. Stop holding on to them, get into the energy of giving away things to help others and to make space in your home. The space that you create in your home will energetically allow new ideas, creations, people, opportunities, etc. to enter your life. Growth towards your potentials on all levels can be stunted if you crowd yourself with clutter. Use spring cleaning as a time to remove clutter and make space in your home and in your life. The most important of all spring cleaning tips for your home is to use natural, non-toxic cleaners. The last thing you want to do while cleansing is to add more pollutants into your environment. Read this page on homemade cleaning products for more information on cleaning your home naturally and the benefits of staying away from many of the commercial cleaners available. It is very easy and economical to use the above ingredients to make all your own cleaners. Many commercial cleaning agents are full of harmful and potentially dangerous ingredients. By using the above ingredients to make your own cleaners you will be using only safe and non-toxic cleaners in your home. There are some further spring cleaning tips on the cleaning your windows, mirrors and glass surfaces page, using a homemade non-toxic cleaner. Keeping the dust in your home under control is something that must be done on a regular basis but during spring cleaning you will be doing this too. 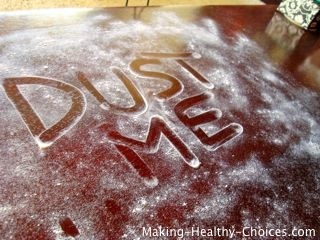 This dusting tips page will give you some tips on how to dust your home using a homemade and all natural cleaner. There will be many pages added to this site containing more homemade cleaning recipes and non-toxic house cleaning tips. Keep checking back or subscribe to this site to know when new things are added. Both cleansing your body and cleaning your home will remove clutter, toxins and allow you to breathe deeply. Take advantage of the energy of spring to do some deep cleansing of your own.